Is it too early for pumpkin? I feel like I don't have much to say today. Except that you need these in your life. They are so worth the time and effort. The color of this dough makes me happy. My apartment smelled like pumpkin heaven. These rolls are indulgent. They are gooey and super sweet. Which is perfect in my opinion, they go great with a cup of tea or coffee. Also, Percy took it upon himself to taste test these for you all. He busted through the plastic and licked the icing off of four or five rolls. So these are kitty approved. And can we talk about how cute that tea for one set is??? Thank you Home Goods. In a small saucepan over medium heat, brown the butter. You know it is done when brown bits form on the bottom of the pan. Remove from the heat and set aside to cool a little. You could just melt the butter in the microwave, but I like the nutty flavor the browned butter gives. Combine the yeast and warm milk in a small bowl and set aside. After 5-7 minutes it should be a little foamy. If not, try a newer packet of yeast. In the bowl of an electric mixer combine the flour, sugars, salt and spices. Add about 1/4 cup of your browned butter (about 2/3 of it), setting aside the rest for assembly, and stir to combine. Next, add the milk-yeast mixture, pumpkin and egg, stirring until combined. Switch to the dough hook and run for 5 minutes on low. Scrape the dough into a large oiled bowl and cover with plastic wrap. Set it in a warm spot for 1 hour, the dough should just about double. While the dough is rising, line the bottom of a 13x9 pan, or two round 9-inch pans, with parchment. Then butter the sides of the pan and the paper. When the dough is finished rising, scoop it onto a well floured surface and flour the top well. Using a rolling pin, roll the dough out into an approximately 16x11 inch rectangle. Brush the reserved browned butter (melt it again if needed) over the dough. Stir the remaining filling ingredients together, and sprinkle evenly over the dough. Starting on a longer side, roll the dough into a tight spiral. I found it easier to do this pretty slowly, the dough is quite soft. And don't worry if some filling comes out of the sides. Using a sharp serrated knife, gently saw back and forth using no pressure at all, and cut about 1 inch rolls. This will help to not squish the rolls while cutting them. 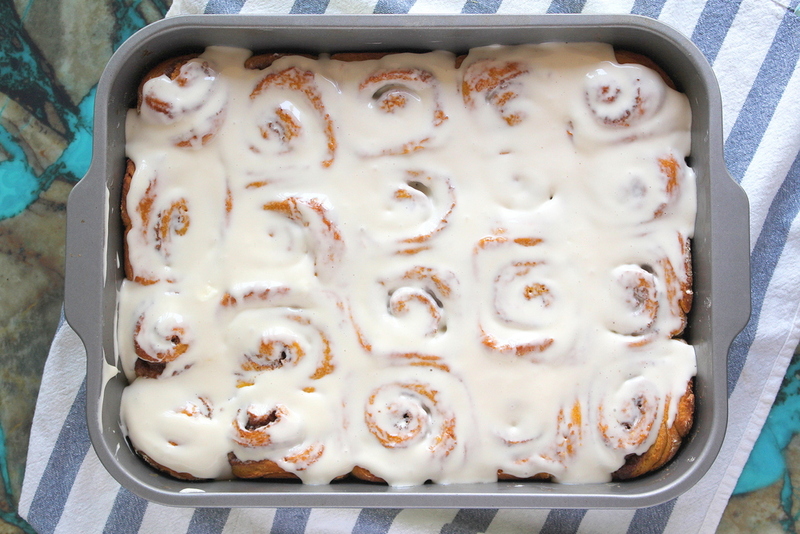 Arrange the rolls in your pan(s), and sprinkle any sugar filling that spilled out on top. Cover with plastic wrap, and let rise again for 45 minutes. 15 minutes before the rolls are ready to bake, preheat the oven to 350 degrees F. While waiting, make the glaze. Beat the cream cheese until light and fluffy. Add the powdered sugar, vanilla and maple syrup and mix. Drizzle in the milk until you reach the consistency you are looking for. When finished rising, remove the plastic wrap and bake for 25 minutes, until puffed and golden. Transfer the pans to wire cooling racks, let cool for a few minutes then top with the glaze and stuff your face.